This exciting new activity book from the AES is an eye-opener to some of the intricate mechanisms of the insect world. If the wings of insects contain no muscles, how can they fold and unfold them? This book explains how they do it, using origami models that you can try out yourself. 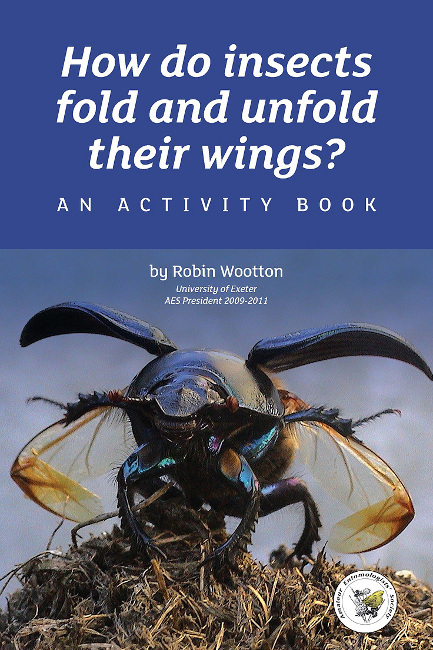 Written by Dr Robin Wootton of the University of Exeter, who is an Honorary Fellow of the Royal Entomological Society and a leading expert in insect flight. This is the first activity book to deal with this subject and contains instructions and diagrams showing you how to make your own wing-folding models. We hope that this book will spark an interest in entomology in those who encounter it, and make them think more closely about the intricate mechanisms of the insect world. Publication of the book has been made possible through a generous grant from the Redwing Trust. AES members are eligible for a significant discount on this publication reducing the price to just £3.25. To obtain a discount coupon please see our Members' only area or contact us for details.